People around the world, today, are more conscious regarding their health and overall well-being. This includes taking care of the kind of food they consume, in what amount, the source of produce, the hygiene standards followed while manufacturing, packing, and transporting the food products, and so forth. Besides, the controversy of dairy produce is taking away the attention. Since years, people have put forth their opinions, indulged into debates, and quite a lot of research has been done on the dairy products to find out if they’re really safe enough to be consumed or not? There’s so much hype surrounding this controversial topic due to a plenty of ideologies, facts, and myths flowing into the consumer market almost every other day. Thanks to the advancement in technology, diverse dairy equipment and milk collection software are being accepted widely across millions of dairy farms for easy and profitable dairy farming. This has been largely used, but also, raised questions on its credibility to the milk industry. While the researchers conducting analysis and generating statistics conclude that there’s absolutely no harm in consuming the dairy products, provided they’re produced maintaining the highest standards of production. 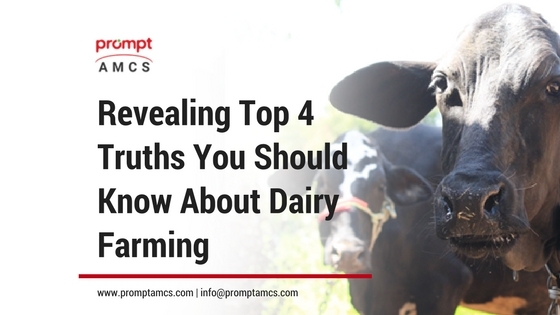 At the same time, it’s equally essential to talk to dairy farmers to learn real facts about dairy farming. Many airy theories are spouted about dairy foods over the internet; scary enough to provoke the consumers to go vegan and inhibit the consumption of any milk product. Here’re a few of such myths which must be demystified for the benefit of the consumers. Organic milk is better than non-organic milk. Organic milk is produced by the cows who haven’t been treated with antibiotics and hormones. While the conventional milk doesn’t necessarily follow such strict guidelines. However, both the types of milk are equally nutritious with mere differences in the price. Antibiotics are given to the cows to prevent or treat mastitis. The farmers ensure that the cows are well taken care of as the healthy and happy cows produce more milk which is in the best interest of the farmers. When the milk is supplied, it is tested multiple times, both at the farm and the dairy processing plant to discard any probability of antibiotic residue. So, even the non-organic milk is as safe as the organic. Presence of blood/pus in milk. The milk supplied by the dairy farms is tested many times to ensure its quality and sterility before it reaches the table. If the milk is found to be free of germs, antibiotics or any other undesirable residues, it is further sent for processing and packaging. Therefore, these tests eradicate any potential of pus or blood in milk. The Somatic Cell Count (SCC) is an indicator of milk quality to determine the number of white blood cells per milliliter of milk. Its low likeliness confirms high milk safety. Pasteurization kills nutrients in milk. If the studies are to be believed, pasteurization doesn’t significantly lower the nutrition level in milk. The procedure only destroys the harmful bacteria in milk to make it safe for consumption. Indeed, the process adds nine vital nutrients like Vitamin A and D amongst others to boost up the nutritional value of milk. FDA and CDC, the leading institutes who administer food and disease control, caution people to avoid consumption of raw milk due to associated foodborne ailments. Dairy foods are bad for health. It is a fact there’re certain people who are allergic to dairy foods just like how the others are sensitive to nuts. But, these people constitute less than even 1% of the global populace. Dairy, in fact, is power-packed with essential nutrients like protein and carbs. It is also a great source of vitamins like A, D, B12, niacin, riboflavin, etc. and minerals like calcium, potassium, phosphorous, to list a few. The ill rumours about the dairy foods do the rounds almost every other day and many people fall prey to them easily. In parallel, the strength of the dairy farms today has outnumbered the count of previous years. As the population is increasing, the demand for the dairy food products is also rising. The numbers bust all the myths. Be assured, take a seat and have a big glass of milk for a happy and healthy morning!